Dogs have a highly sensitive nose and scent-work is a natural behaviour for a dog. It is essential in hunting and finding prey. Our scentwork classes are fun and provide great mental stimulation for your dog. 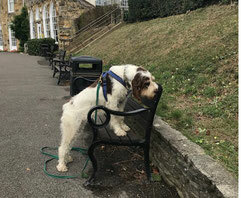 Scent work classes are suitable for dogs of all ages and breeds. As each dog works individually, the classes are particularly suitable for shy dogs and dogs that have difficulties working near other dogs (e.g. in a group class environment). Martina's approach to these sessions will be to view your pet as an individual. Knowing that owners want the very best for their pet, she is passionate about helping owners and their pets maximise the joy that pet companionship can bring.